Dogs can exhibit signs of excessive water drinking for a variety of reasons, including life-threatening dehydration, illness, side effects to medication, diet and physical activity, according to WebMD. 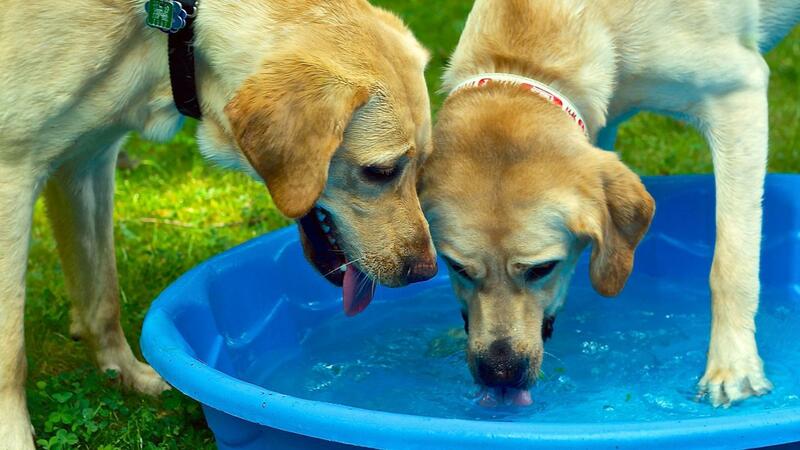 If a dog is dehydrated, it may also have a dry tongue and gums, be lethargic and exhibit thick ropelike saliva. Illnesses such as liver disease, diabetes, Cushing's disease, diarrhea, fever and infection can also cause dehydration. WebMD explains that some drugs, such as prednisone, furosemide and phenobarbital, can lead to excessive thirst in a dog. A diet high in sodium is very dangerous to a dog's health and can cause a dog to drink more water than usual. If a dog has consumed too much sodium, especially from unhealthy foods, it may experience tremors, diarrhea, depression and vomiting. Dry dog food contains only up to 10 percent water and has the potential to dehydrate dogs. WebMD stresses the importance of knowing a dog's regular drinking patterns so that changes to drinking behavior are visible more quickly and assessed appropriately. Dogs should consume roughly 1 ounce of fluids per pound of body weight each day. Active and lactating dogs usually require slightly more than the recommended amount, and puppies may also be thirstier. What Are Some Signs That Your Dog Might Be Having Health Issues? Why Won't My Kitten Eat? How Easy Is It to Cure a Dog That Has Diarrhea?